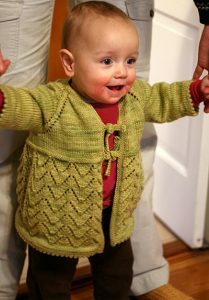 Helena Free Lace Baby Cardigan Knitting Pattern by Alison Green Will. 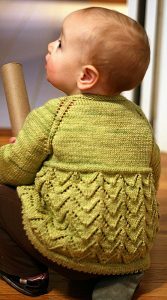 “This pretty little sweater-dress is knit using top-down raglan construction for minimal finishing. Using a hand-dyed semi-solid yarn allows for some color variation without obscuring the lacy “skirt” pattern.